The ISIS module was planning attacks on important political and security offices in Delhi, said an NIA official. NEW DELHI: The NIA on Wednesday claimed to have busted an Islamic State module by arresting 10 people, including the group leader, who were allegedly planning terror attacks targeting some political personalities and security establishments as well as crowded places in Delhi and the national capital region. The arrest of the members of the module, "Harkat-ul-Harb-e-Islam", was made after the National Investigation Agency (NIA) carried out searches at 17 places, including six places in East Delhi's Jafarabad area, six places in Uttar Pradesh's Amroha, two places each in Lucknow and Hapur and one place in Meerut. Six others, who are suspected to be members of the group, have also been detained and they are being questioned. Addressing a press conference, NIA spokesperson and Inspector General of Police (NIA) Alok Mittal said that the suspects were planning attacks in Delhi but he refused to share when they were planning those attacks. He said the agency arrested the head of the Harkat-ul-Harb-e-Islam, Mufti Suhail, a resident of Amroha from his house, who is also a Maulvi in a mosque. The official said the module was planning attacks on important political and security offices in Delhi as well as crowded places. "They were planning to detonate a remote-controlled bomb or a fidayeen kind of attack," he said. Asked about the handler of the Harkat-ul-Harb-e-Islam, Mittal said the agency was trying to ascertain his identity and his country. He said the arrested suspects also tried making a bullet-proof fidayeen vest. It was recovered from Amroha. A country-made rocket launcher, 12 pistols, 112 alarm clocks, 100 mobile phones, 135 SIM cards, many laptops and various electronic gadgets, besides 150 rounds of ammunition were also recovered during the searches. The official said the group was a self-funded one and a few of the members stole gold ornaments from their homes and sold them to fund their activities. "During questioning two brothers confessed that they sold gold jewellery worth Rs 5 to 6 lakh," the official said. He said that the group came on the NIA's radar after credible information that a group of pro-IS individuals have formed a terrorist gang and are preparing to carry out terrorist attacks targeting vital installations, sensitive locations and crowded places in and around Delhi and the national capital region (NCR). "The inputs were further developed and field verifications were done. 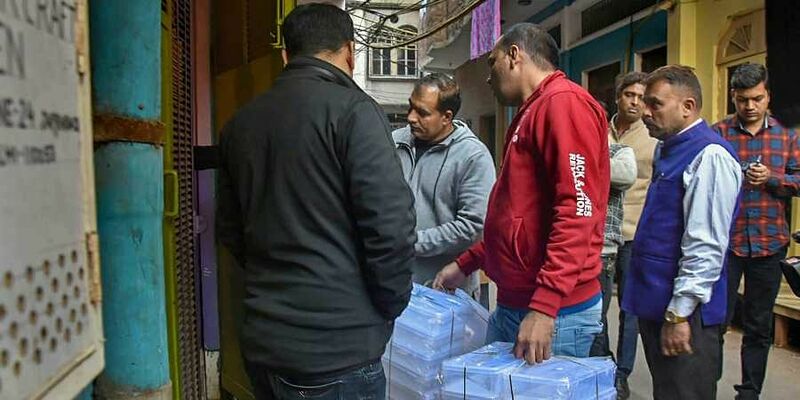 It was ascertained that Suhail alias Hazrath and his associates have mobilized funds and have procured weapons, ammunition and explosive material to prepare IEDs and bombs and they plan to carry out explosions and fidayeen attacks at places of importance in and around Delhi and also target crowded places," the IG said. Mittal said that all the arrested people are in the age group of 20 to 29 years. Besides Suhail, the agency arrested Saeed, 28, Raees Ahmed, Saqib Iftekar, 26 and Mohammad Irshad from Amroha. It arrested Anas Yunus, 24, a B. Tech student of Amity University in Noida, Rashid Zafar Raq, 23, Zubair Malik, 20 and his brother Zaid Malik, 22 and Mohammad Azam, 35, from Delhi's Jafarabad area. According to NIA officials, Yunus was instrumental in procuring electrical items, alarm clocks and batteries etc. in furtherance of their terror conspiracy. The two brothers Saeed and Raees arrested from Amroha had procured a huge quantity of explosive material for preparing IEDs and pipe bombs and were instrumental in fabricating a rocket launcher to carry out terrorist attacks. Mittal also said that Azam, who runs a medical shop in Seelampur area of Delhi and Saqib Iftekar in Amroha helped Suhail in arranging the weapons. He said that the two brothers Zaid and Zubair were also part of the terror conspiracy and were instrumental in procuring batteries, connectors, SIM cards on fake documents and mobilising funds for buying bomb-making material. Asked how these people made bombs and the rocket launcher, the officer said that they took the help of the Internet to make bombs and the rocket launcher. He said that after the questioning of the six other accused more arrests will be made in the case. All the arrested people will be produced in a Special NIA court in Delhi on Thursday. 100 alarm clocks with Amroha terror module! ... Cause for BIG alarm!! NIA and ATS police must find all handlers and related terror modules. ... Terrorists have no religion according to Dr Sashi Tharoor. Is it true ...? ... But NIA must find all maulvis and madrasa employees who are evil and involved in this and other such modules! religion of peace at work. now people like Mr.Shah will not open their mouths. All engg. students in Amity University must be checked for links to "Harkat-ul-Harb-e-Islam" group. Please rename university to 'Peace & Amity University' soon.